Andrew, as GamerDad, was the Keynote Speaker for the American Library Association’s 2008 Technology Conference in Nov. 2008. Andrew spoke in front of 1000 librarians and library professionals about video games and children. September ’08 Andrew and family appear on BBC Radio One. Andrew S. Bub negotiated with WhatTheyPlay Inc. The conversations led to WTP buying over 1000 GamerDad reviews. Andrew is pleased that the work of his friends and himself not only ended up paying off, they will still help parents. Andrew, as GamerDad is flown out to San Francisco to advise the Leap Frog company about their future products. Andrew has a massive heart attack and a quadruple bypass surgery. He survives. In response the Internet gaming community and his own fans rally to his side with over 1000 PayPal donations – each email begs me to continue my work. 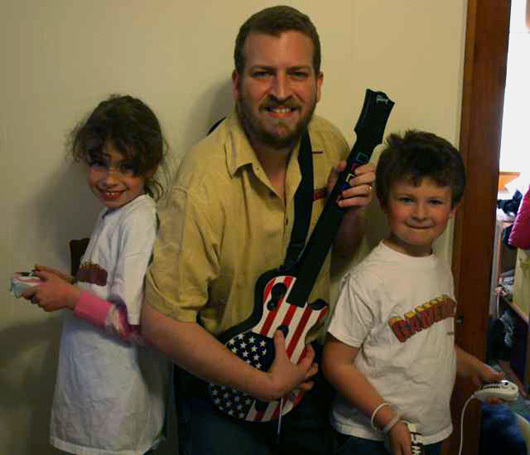 Since January 2008 Andrew Bub has been proud to write “WhatTheyPlay.com’s” AskGamerDad column – the first advice column about games for parents. From December ’08 to December ’09 Andrew as GamerDad launched both the “GamerParenting” and the “Political Arena” columns. These columns included expert analysis of the video game industry. In April ’08 The Entertainment Software Association (ESRB) and the National Parent Teacher Association (PTA) hired GamerDad to help write a brochure about video game safety and ratings. Andrew, as GamerDad, also appeared on set with Patricia Vance, President of the ESRB and Jan Dommine, President of the PTA and a Chicago radio host who calls himself “The Technology Tailor” for an online interview and Q&A with viewers. Ten copies of the brochure went out to every PTA in America. Andrew as GamerDad appears on Chicago Radio program “The Technology Tailor” in Chicago. He’s the guest that follows ESRB Pres. Patricia Vance. 2005-2008 Andrew writes reviews for CommonSenseMedia.org. USA Today, CNN, Sports Illustrated, Maximum PC, GamePower, GamePro, TechTV, PCGamer, and Prima Publishing.Contributing Editor: Computer Games Magazine, PCGamer, PCUpgrade, Maximum PC, Laptop Magazine, InQuest, GameSpy, Yahoo Games Domain. Author of 4 Strategy Books and several unpublished Children’s Books.